Every man, however matter-of-fact and prosaic, likes to receive his presents wrapped… He hesitates to cut the string; he prefers to untie the knot, to unfold the paper, and so to come slowly upon the fond surprise awaiting him. The contents element he will be able to enjoy for months, perhaps for years; the parcel element he can only enjoy for a few blissful seconds; he therefore lingers over it that he may taste its drawn out sweetness to the full. It is part — and a striking part — of our human love of mystery. Like so many other things that are pregnant with romance, brown paper and string look commonplace enough; yet, in reality, they embody all the wistfulness, the tenderness and the sacredness of Christmastide. Wrapped in flesh! It is the phraseology of the parcel! The child’s eyes sparkle as he catches a glimpse of the present through the paper. Human eyes have been entranced as they have beheld the unspeakable gift ‘wrapped in flesh‘ — the Deity Incarnate! I read that passage the other morning and immediately thought of my mother. She could unwrap carefully with the best of them. 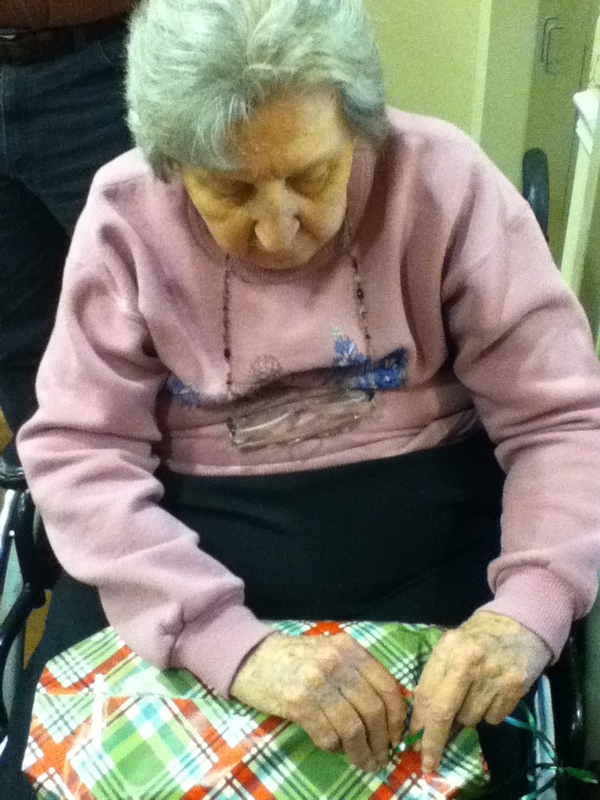 Below is a post I wrote in 2013 about my mom unwrapping a Christmas present. “Mom, the suspense is killing me,” I told my mother yesterday. She took, oh, I don’t know, close to twenty minutes to unwrap a single gift. My mother has always been a careful unwrapper. I would blame it on our Scottish heritage, except that’s my father’s side of the family. Are the Danish thrifty too? For as long as I can remember, though, she has carefully peeled the tape off packages so as not to tear the wrapping paper. It can be reused, don’t you know. Alzheimer’s hasn’t taken that trait away from her. Old age has slowed her down. When you combine the two, well, let’s just say, it can take a painfully long time to unwrap a gift. “Here’s a gift from Donabeth,” I said, placing it in her lap yesterday. She looked at me with watery eyes. I wasn’t sure she understood. “Open it, Mom. Let’s see what’s inside,” I said. She held it on her lap for a long time. I suggested, cajoled, encouraged, prodded, goaded, urged. Nothing seemed to work. Finally I said the line about suspense. “That’s the name of the game,” she said. “Suspense.” Maybe she was more aware than I gave her credit. She turned the package over and began picking at the tape. Did I mention that this was a slow process? So slow, in fact, that she fell asleep while doing it. Fortunately it was just one of the doze-y little catnaps that lasts only a few minutes. Once the pretty paper was removed we found that my sister had the nerve to also wrap the gift with a layer of bubble wrap. I began the same “encouragement” process, but Bud came over and simply removed the bubble wrap. None of this waiting around stuff. The suspense was killing him, too. Inside was a music box that played “Amazing Grace.” My mother listened to “Amazing Grace” over and over. When I thought she had lost interest, I put the music box on the table. I went to do something else and heard it playing again; my mother had retrieved it and opened it again. Over and over. Music still touches something deep inside. I’d say she liked it. 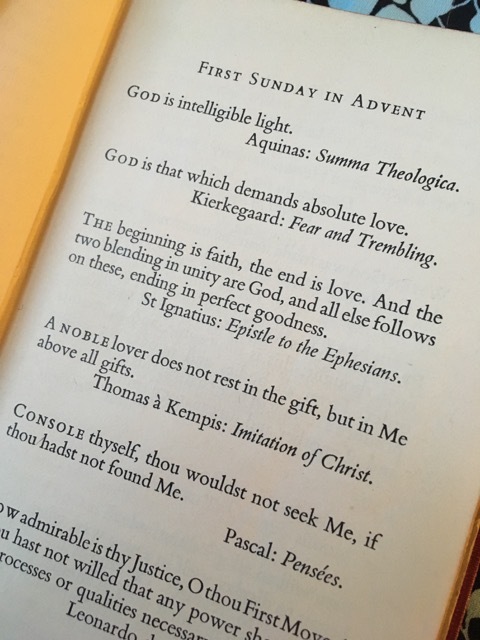 I peeked at the first page of The New Christian Year (compiled by Charles Williams) one last time before putting it on the shelf. My well-worn copy is even more well-worn now that I’ve been through the book several times. The New Christian Year isn’t so new anymore. My copy is from 1941 — and it was written in but not falling apart when I got it. I picked it up at a used bookstore, not knowing what a dear friend it would become. It’s falling apart now, like a Velveteen Rabbit of books. Charles Williams introduced me to so many Christian thinkers — St. Augustine, John Donne, Lancelot Andrewes, William Law, and Blaise Pascal to name a few. The New Christian Year helped me fill my bookshelves with deep, rich books. But, when I read Brueggemann’s Sabbath as Resistance earlier this year, I knew I was reading a modern author who would challenge me to change my life and deepen my faith. I ordered Gift and Task as soon as I finished the Sabbath book. When it arrived, I set it aside. I would have to wait for Advent, the start of the Christian year. 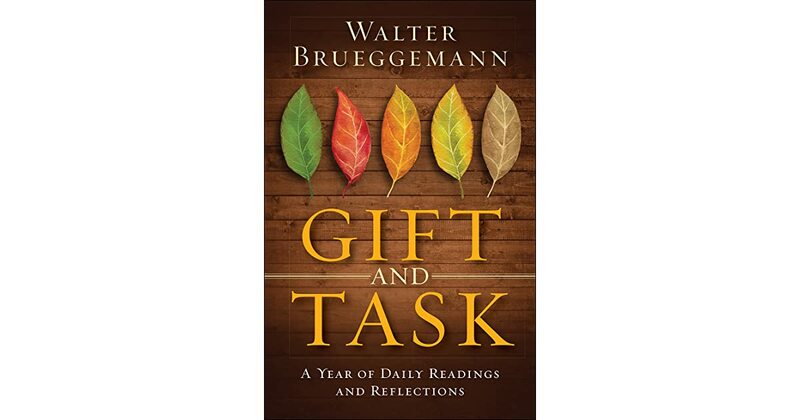 My brand new copy of Walter Brueggemann’s Gift and Task beckoned me this morning. All those pages so new and clean. Oh — to write in the margins! Brueggemann starts the Christian year not with light and hope, but with a roar. …Christmas is not a safe, private, or even familial enterprise but is preoccupied with great public issues of war and peace and issues of economic justice that concern the worth and bodily well-being of human persons. Our Advent preparation may invite us to consider the ways in which we ourselves are complicit in the deep inhumanity of our current world. The lion opens space for the Lamb, who will arrive soon. I hope I’m ready for this new Christian year.